A Chinese Ming era stem cup will be auctioned in Lyon & Turnbull's Asian art sale in Hong Kong on May 31. The piece dates to around 1425 and is expected to sell for in excess of $2.8m. 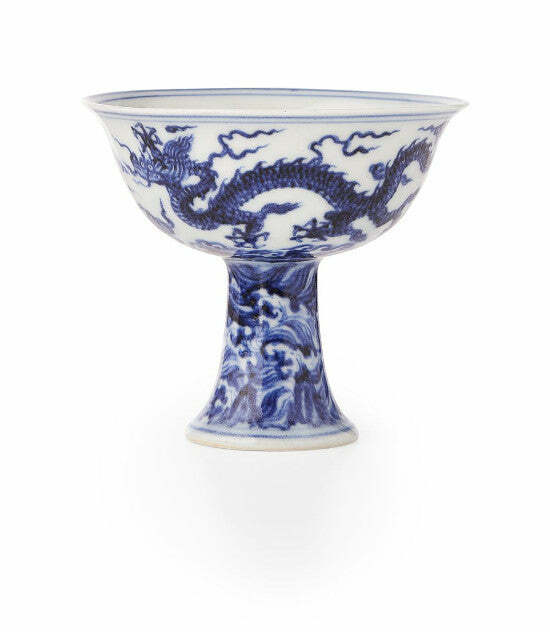 Lee Young, Lyon & Turnbull's head of Asian art, comments: "The Ming Xuande (1426-35) mark and period blue and white Stem Cup is a rare masterpiece and, of its type, is virtually unseen outside museum collections. "The motif of flying dragons was popular in the Yuan dynasty, but was revived in the Xuande dynasty as can be seen in this case."